Home Tags Posts tagged with "Arrest"
Suffolk County Police arrested a man for allegedly endangering the welfare of a child after he allowed his 13-year-old daughter to drive with a 3-year-old child in the backseat. A 2nd Precinct community support unit officer observed a 1995 Toyota Camry being driven erratically while traveling northbound on Oakwood Road in Huntington Station Jan. 27 at approximately 6:30 p.m. The officer initiated a traffic stop of the vehicle and noticed a young girl was driving. The girl’s father, Alejandro Noriega, was in the front passenger seat. The 3-year-old male child was in a child safety seat in the back of the vehicle. Noriega had been entrusted by a friend to baby-sit the boy. Noriega, 45, of Huntington Station, was arrested and charged with two counts of endangering the welfare of a child. He was also issued a summons for permitting unlicensed operation. The 13-year-old girl was released to her mother at the scene. The 3-year-old boy was released to his mother at the 2d Precinct. Noriega was held overnight at the 2nd Precinct and was scheduled to be arraigned Jan. 28 at First District Court in Central Islip. Suffolk County police arrested a Coram man after he robbed a pizza shop delivery person at knifepoint in Port Jefferson Station Nov. 11. Ricardo Vargas ordered food from Bella Maria Restaurant and Pizzeria in Coram to be delivered to King Street in Port Jefferson Station. He selected the delivery address at random. When the delivery person arrived, at approximately 9:40 p.m., Vargas, who had been waiting nearby, approached him, displayed a knife and demanded money. The delivery person complied, and Vargas fled on foot with cash and the food. The victim, a 61-year-old man, called 911, and 6th Precinct Police officers, 6th Squad detectives, Aviation Section officers and Canine Section officers responded, and after searching the area, located and arrested Vargas on nearby Hewes Street at 11:30 p.m.
Vargas, 27, of Selden, was charged with first-degree robbery, as well as an outstanding misdemeanor warrant. Suffolk County police arrested an Amityville woman, who is an employee of United Cerebral Palsy, for falsely reporting an incident about a sexual offense between an employee and a resident at the group home Sept. 13. An anonymous caller made an allegation to the New York State Justice Center for the Protection of People with Special Needs that a male employee of a United Cerebral Palsy residence, on Indian Head Road in Commack, inappropriately touched a female resident of the home. An investigation 4th Squad detectives determined the anonymous caller was another employee, Judy Campbell. Campbell, who had previously dated the male employee, admitted she lied about the allegation. A further investigation concluded no abuse occurred. Campbell, 53, was arrested and charged with third-degree falsely reporting an incident. Campbell will be arraigned today at First District Court in Central Islip. A Mastic man in possession of drugs, who allegedly intentionally struck three police vehicles injuring a detective May 23, was arrested in Centereach. Paul Sommer was sitting in his vehicle, parked in the Wendy’s parking lot at 2278 Middle Country Road in Centereach, when he was approached by 4th Precinct detectives and police officers who believed he was engaged in a drug transaction at approximately 2:30 p.m. Detectives identified themselves and Sommer attempted to flee, rammed a police vehicle and struck a detective. The detective, who was outside of his vehicle when he was struck, was transported to a local hospital where he was treated for non-life-threatening injuries. Sommer fled from the parking lot, and a short time later, he intentionally crashed into two police vehicles at the intersection of Hawkins Avenue and Nicholls Road in Centereach where he was taken into custody. Fourth Squad detectives charged Sommer, 22, with third-degree criminal possession of a controlled substance, fourth-degree criminal possession of a controlled substance, third-degree criminal sale of a controlled substance, two counts of possession of drug paraphernalia, second-degree assault, three counts of third-degree criminal mischief, first-degree reckless endangerment, two counts of second-degree reckless endangerment and resisting arrest. Sommer was held at the 4th Precinct and was scheduled to be arraigned at 1st District Court in Central Islip. Rocky Point subsitute teach Aimee Otero has ben arrested for inappropriately touching a student at Rocky Point High School, according to Suffolk County Police. Last month, Special Victims Section detectives began an investigation into the conduct of Otero after being contacted by administrators at Rocky Point Union Free School District. Detectives determined Otero, 25, inappropriately touched a 16-year-old male student in a Rocky Point classroom April 7. Special Victims Section detectives arrested and charged Otero, of Coram, with third-degree sexual abuse and endangering the welfare of a child. Otero was issued a desk appearance ticket and will be arraigned on a later date. Rocky Point Superintendent Michael Ring addressed the incident in an emailed statement through a district spokeswoman. “The district has been notified by Suffolk County Police that a substitute teacher, who has worked for the district at the secondary level, has been arrested for inappropriate conduct with a Rocky Point High School student,” he said. “The arrest comes after the district was made aware of allegations brought forth by the student, and after the district conducted our own internal investigation during which we brought the matter to the attention of law enforcement. “The district is always committed to the safety and well–being of our students and we take matters such as this very seriously. The individual responsible for these allegations, who passed all mandatory New York State background checks prior to employment, has worked as a substitute teacher in the district for varying lengths of time since November 2015. Based on these allegations and subsequent arrest, this person will no longer work for the district. Attorney information for Otero was not immediately available. This story was updated May 5 at 1:50 p.m. to include Ring’s statement. 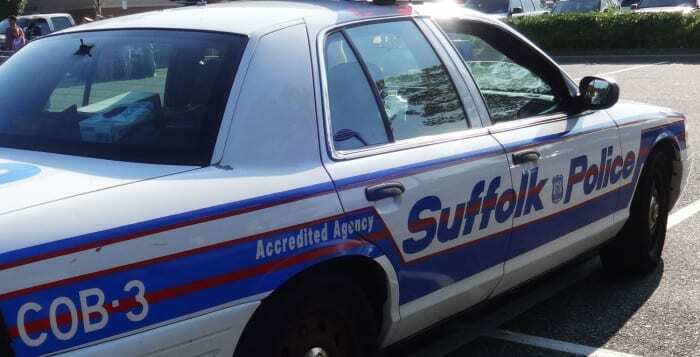 Suffolk County Police have arrested two Selden men in connection with multiple robberies that occurred earlier this week. Following an investigation by Sixth Squad detectives, Frederick Staria III and Jason Kinlaw were arrested in connection with three robberies and an attempted robbery. Staria entered businesses, threatened the use of a weapon and demanded cash. He fled with an undisclosed amount of money. In one incident, the employee did not comply and Staria fled without proceeds. During two of the crimes, Kinlaw drove Staria to the locations. Staria, 35, was charged with three counts of third-degree robbery, third-degree attempted robbery and four warrants. Kinlaw, 24, was charged with third-degree robbery and third-degree attempted robbery. They were held overnight at the Sixth Precinct for arraignment Feb. 14 at First District Court in Central Islip. Suffolk County Police arrested two adults for hosting a party at their Sound Beach residence Feb. 11 after a teenager needed medical attention. Seventh Precinct Patrol officers responded to a call from a parking lot across from 271 Echo Ave., at approximately 10:55 p.m., after a teenage girl became ill from alcohol consumption. The girl was coming from a party. When police arrived, there were more than 100 underage teenagers spilling out into the street. Alcohol was at the party. The girl was transported to a local hospital for treatment. Police arrested and charged the hosts, Charles Suomi, 40, and Farnelle Marseille 35, with violating the social host law. Both were issued field appearance tickets and released. They are scheduled to be arraigned at First District Court in Central Islip on April 12. A 30-year-old man from Bay Shore entered through the window of a second-floor apartment on Smith Road in Lake Grove at about 8:30 p.m. on March 26, police said. The man escaped the apartment without taking any items. When approached by police, he gave a fake name and date of birth. He was charged with second-degree burglary and false impersonation. At the intersection of Route 25 and Edgewood Avenue in Smithtown on Jan. 12, a 25-year-old woman from Setauket was involved in a car crash just after 8 p.m., according to police. After the crash, she fled the scene without exchanging contact information with the other driver. She was charged with leaving the scene of an accident with property damage. At about 4 p.m. on March 25, a 41-year-old man from Brentwood driving a dump truck crossed the white pavement line on Terry Road in Nesconset, hitting a parked 2014 Dodge with the driver inside. No one was seriously injured. The man was charged with reckless driving. A 21-year-old man from Northport and a 22-year-old man from Islip were seated in a parked vehicle on West Main Street in Kings Park at about 5:30 p.m. on March 26 when, police said, they discovered the pair was in possession of more than 25 grams of marijuana. They were charged with fifth-degree criminal possession of marijuana. At about 10 p.m. on March 26, police said a 34-year-old man and a 37-year-old man both from Ronkonkoma shouted obscenities and threats at police officers and members of the Lakeland Fire Department near a home on West 3rd Street. They were arrested and charged with second-degree obstruction of governmental administration. Just after midnight on March 19 at South Beach Saloon Inc. in Nesconset, a 23-year-old man from Ronkonkoma punched another man in the face, police said. He was charged with third-degree assault with the intent to cause physical injury. On March 24, a 22-year-old man from Lake Ronkonkoma was found to be in possession of a stolen and damaged iPod on Ronkonkoma Avenue in Islip at about 12:30 p.m., police said. He was charged with fifth-degree criminal possession of stolen property and criminal mischief. At about 5 p.m. on March 24, a 41-year-old woman from Lake Ronkonkoma stole assorted electronics from Sears in the Smith Haven Mall, police said. She was later arrested in Brookhaven and charged with petit larceny. On March 24 at about 7:30 p.m., a 23-year-old woman from Patterson, N.J., was arrested in Commack for possessing a Pennsylvania driver’s license that did not belong to her, police said. She was charged with second-degree possession of a forged instrument. An unknown person kicked in the fence of a home on Morris Avenue in Lake Ronkonkoma at about 3 a.m. on March 27, police said. On Wheeler Road in Hauppauge at about 2:30 p.m. on March 27, an unknown person dented the driver’s side rear door of a 2000 Toyota, according to police. Police said an unknown person damaged the screen of a window at a home on Barley Place in Commack at about 11:30 p.m. on March 26 with a BB gun. An unknown person approached a man at a Smithtown home just after midnight on March 26 carrying a handgun, police said. The man with the gun demanded money from the victim and then hit him in the head repeatedly with the gun, causing lacerations to the victim’s head, according to police. The man fled on foot. An unknown person broke the driver’s side window of a 2006 Toyota parked at Dave & Buster’s in Islandia on March 24 at about 11:30 p.m., according to police. A wallet with credit cards was taken from the car. At the Devonshire apartment complex in Hauppauge, an unknown person scratched the driver’s side front and rear doors and tailgate of a 2015 Dodge at about 10:30 a.m. on March 24, according to police. On March 22, an 18-year-old man from Port Jefferson Station was arrested for criminal possession of stolen property, a 2012 Mercedes-Benz. Police pulled over and arrested the man around 4 p.m. on Route 112. A 19-year-old Port Jefferson Station man was arrested on March 26 for driving while ability impaired, after allegdly being caught sleeping in the driver’s seat of his running 2016 Hyundai, which was blocking the intersection of Route 112 and Nesconset Highway. Police arrested the suspect at the scene, around 4:21 a.m. According to police, a Sound Beach woman was arrested on March 26 for petit larceny and criminal possession of stolen property. Police said on Oct. 11, the 27-year-old woman had stolen jewelry and assorted merchandise from Kohl’s on Route 25A in Rocky Point. She was also using a Florida driver’s license that didn’t belong to her. Police arrested her at the 6th Precinct. On March 23, a man from Centereach was arrested for criminal possession of marijuana. The 27-year-old was in his 2012 Mazda on the corner of Blydenburgh Road and Horseblock Road when police discovered him in possession. A 22-year-old woman was arrested on March 21 for petit larceny. The Yaphank woman allegedly had stolen someone’s phone on Middle Country Road in Centereach several days before. Police arrested a 30-year-old man from Rocky Point for two counts of criminal possession of a controlled substance after discovering him in possession of two different prescription medications that he wasn’t prescribed. Police arrested him on Westchester Drive in Rocky Point on March 21. Police said someone stole medication from a store on Route 25A in Miller Place. The incident happened on March 26 around 10:25 p.m.
On March 22 around 3:08 p.m., police arrested a 31-year-old man from West Babylon for grand larceny. According to police, the man stole money from the Capital One bank on Route 25A in Setauket after he deceived the teller. Police didn’t expand upon what the man did to acquire the money. Between March 25 at 9 p.m. and March 26 at 6:30 a.m. at Broadway, Port Jefferson Station, an unidentified person broke the front passenger window of a 2015 Ford pickup truck. According to police, someone entered the L.I. Pour House on Route 112 in Port Jefferson Station on March 23 at 2:30 a.m. and stole a metal box that contained cash. On March 26 around 3:47 a.m., an unknown person punched a man near the Junior’s Spycoast bar on Main Street in Port Jefferson. According to police, someone stole a wicker chair from the front yard of a residence on Broadway in Rocky Point. The incident happened on March 25 around 8 p.m. Between March 21 at 6 p.m. and March 22 at 7 p.m., an unknown person entered an unlocked 2006 Nissan Altima and stole cash and several gift cards. Police said the incident happened at a residence on Oak Street in Centereach. On March 26 at 10:20 p.m., a man left his residence on Newton Avenue in Selden to investigate a noise when an unknown person approached the man and threatened him. Police said the complainant was taken to Stony Brook University Hospital after the suspect cut the man in the stomach. Someone broke into a 2015 Maserati parked near the AMC Loews theater on Nesconset Highway in Stony Brook and stole backpacks and two passports. Police said the incident happened on March 24 around 9:03 p.m.
On March 27 at about 8:30 p.m., a 46-year-old man from Dix Hills was driving a 2004 Mercedes on Vanderbilt Parkway near the intersection of Hearthstone Drive when he crashed on the side of the road and then fled the scene, police said. He was later arrested and charged with leaving the scene of an accident with property damage. Police said a 38-year-old man from Huntington Station possessed heroin near the intersection of Cooper Avenue and Route 25 at about 10:30 p.m. on March 25. He was arrested and charged with seventh-degree criminal possession of a controlled substance.